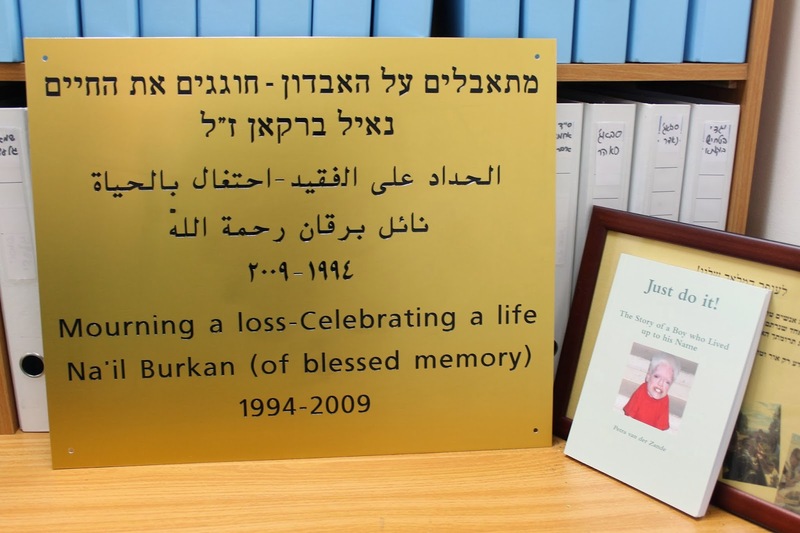 Planting trees in memory of Na’il Burkan. On February 4, 2009, the Lord called our beloved Na’il Home at the age of 14. To keep the memory of this special child alive, I wrote the book Just do It! - the story of his life and about the twelve years we had the privilege taking care of him. 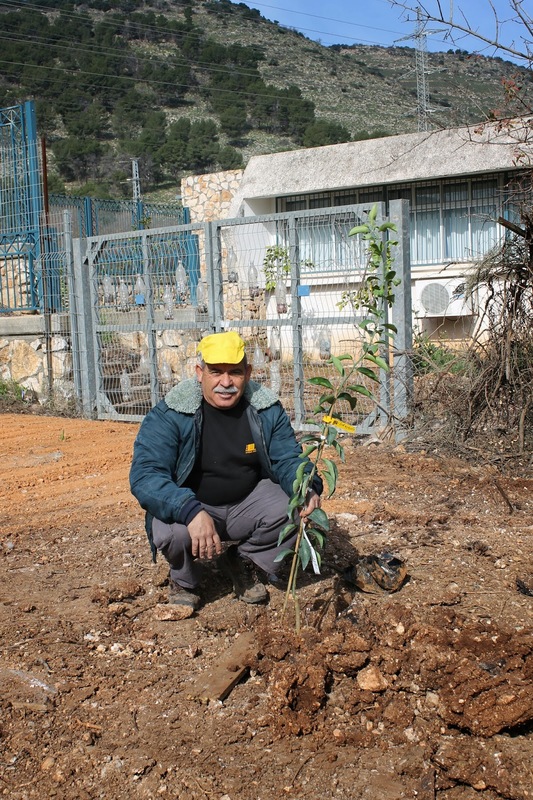 For the Jewish people, planting a tree is a sign of hope, a sign of life. 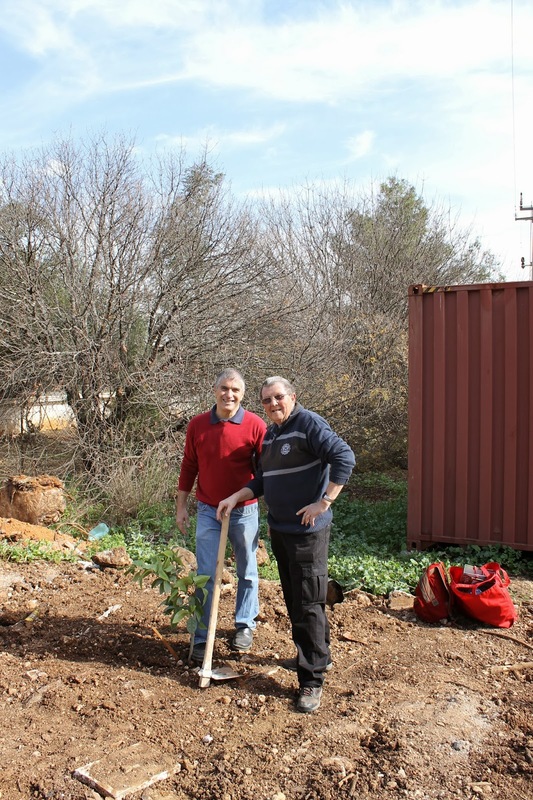 In memory of Na'il, American friends had two trees planted in Israel in 2009 through the Jewish National Fund. 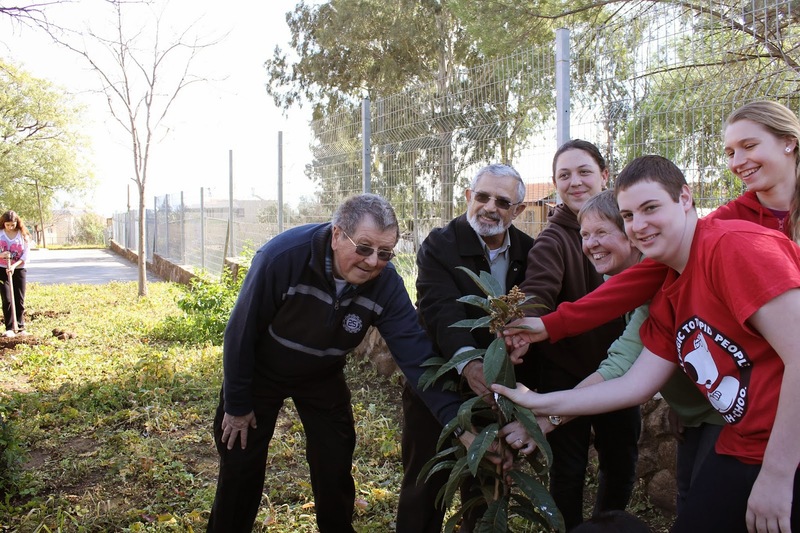 People plant trees for many different reasons and help green the land of Israel while sending a special gift to a friend or loved one. 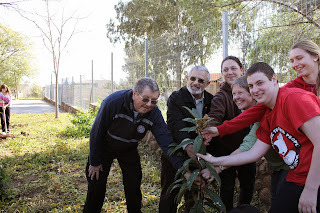 Over the last 100 years, the JNF has planted over 240 million (!) trees. 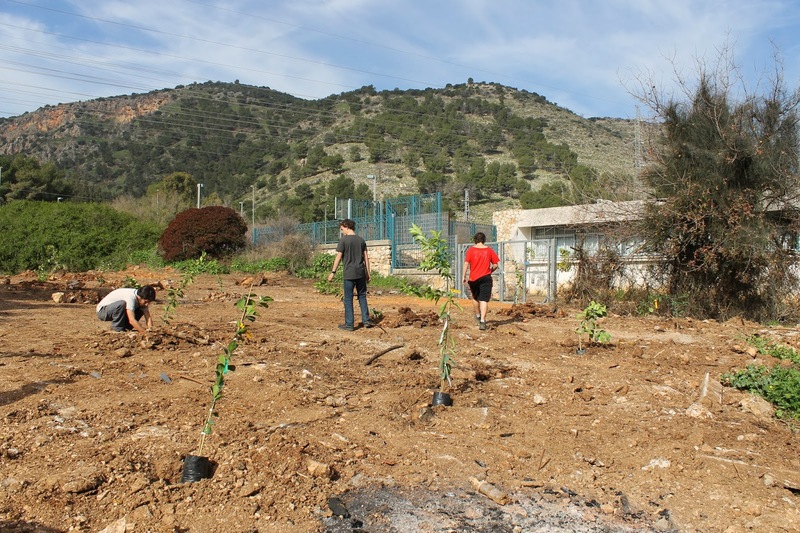 (This year on Tu b’Shvat, over 600,000 saplings were planted throughout Israel.) Wim and I decided to collect funds for a garden in honour of Na'il. A garden contained 100 trees, and people could fund one or more trees. However, as time went by, we decided to give the money to ICEJ-Aid, the social assistance department of the International Christian Embassy Jerusalem. Our friend Yudit was asked to look for a suitable project in Israel. We wanted to bless an organisation with trees which at the same time would be a memorial to Na’il. 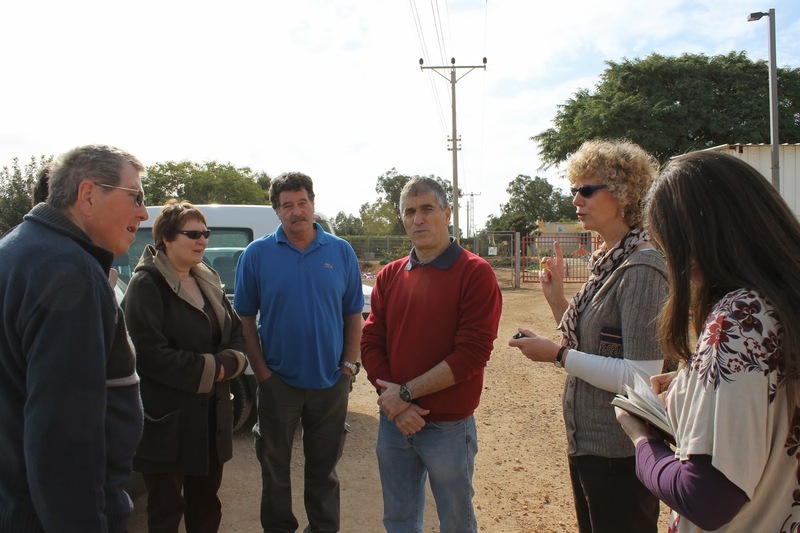 Through Offer, an Israeli friend, Yudit learned about two special projects in the most northern part of Israel - near Kiryat Shmona. One was a special education school for special needs children in the region. Staff and children came from Jewish, Muslim Arab, Christian Arab and Druze backgrounds. The other project was a rehabilitative day center where special needs adults came to work. My heart rejoiced! It was so fitting! It felt so right! Located within the boundaries of the Mevo’ot Hermon Regional Council, the Shechafim Regional Special Education School has a student body of about 60 students with medium to high levels of cognitive impairment. Most of them have motor and sensory limitations, like Cerebral Palsy, physical handicaps and impaired vision. Six days a week, children between 6 and 21 years of age, attend school from 8 AM to 6 PM. (Fridays until 2 PM). 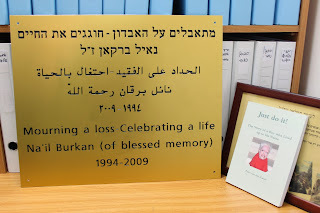 In Israel, when you donate something, you are expected to also bring a plaque (when you want to be remembered). We wanted everyone to know these trees were in honour of Na’il, so we had two beautiful plaques made. 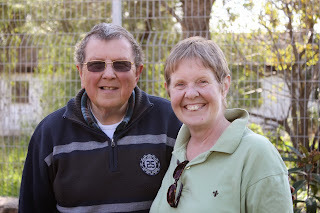 On January 24, 2013, Wim and I left Jerusalem at 6.30 a.m. for the long journey to Kiryat Shmona. Yudit and Estera, who was to write an article for the Word From Jerusalem magazine about this event, drove their own car. Planning to stay a few days in Tiberias, our Dutch friends drove their rented car. We enjoyed the trip but were also a bit tense, and wondered if we would make it in time for the first project. The ceremony was scheduled for 10 a.m.! At Tsomet Koach (Koach Junction), Offer Michaeli, our Israeli contact, was already waiting for us. Our line of cars followed him to the school. We longed for a cup of coffee after the long, three hour ride, but found there was no time for that. Ishai Adler, the principal of the Shechafim School was in a hurry. We received a warm welcome in Hebrew, translated by Yudit into English, at the parking lot. After a short detour to the toilets, Ishai gave us a quick tour of the school. The moment we entered the special education facility, I immediately felt at home. When our foster children were small, they attended similar schools in Jerusalem. However, the difference between this school and the ones in Jerusalem was enormous: this regional school was blessed with so much space, inside and outside! 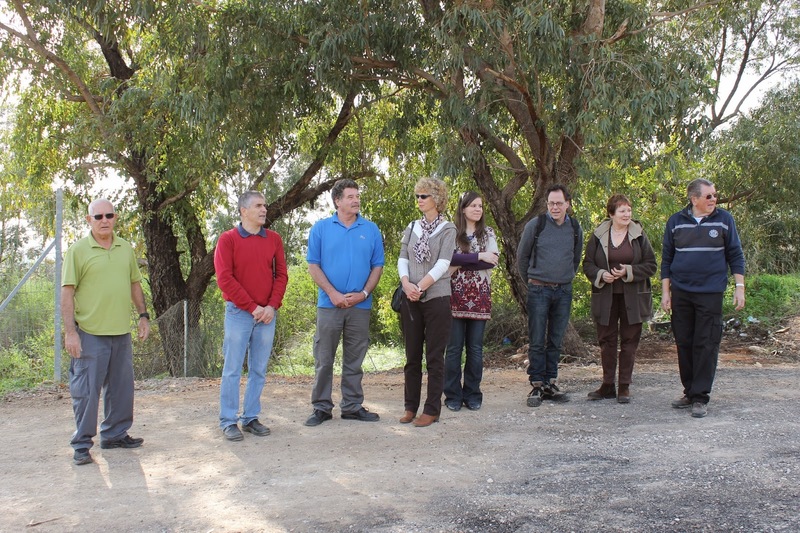 Thanks to a contribution of the KKL/JNF, a beautifully landscaped schoolyard with a roofed playground was created. There is plenty of fun playground equipment, a greenhouse where children learn to feel, touch and even taste, a herb garden and a petting zoo. To protect the children’s privacy, we were not allowed to take pictures; therefore, there are no pictorial reminders of the ‘choir’ which sang in honour of the event. 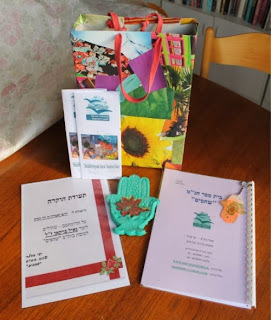 After a short speech, Ishai handed us a certificate of honour, together with some presents the children had made. It was so precious! I (Petra) was then invited to say a few words in Hebrew. Offer read a moving text he had written for both occasions. I realized he was a ‘kindred’ spirit, a man with a deep love for these special children and a desire to help them wherever he could. A big area had been cleared of bushes and prepared to plant part of the 40 citrus trees we donated to the school. When they had cleared the rest of the area, the other trees would also be planted. Helped by the staff, some of the children took part in this moving event. Deeply inhaling the fresh air, I enjoyed the beautiful view: the school is surrounded by high mountains and lies near a river bed. A staff member of the school proudly showed me a short video on his I-phone. When it rains, a thundering stream runs down the mountain. A forested area had been transformed into a park to enjoyed by the children and the staff. Wind chimes, winding paths suitable for wheelchairs and strollers, drinking fountains hewn from rock were equipped with special handles - it was beautiful. 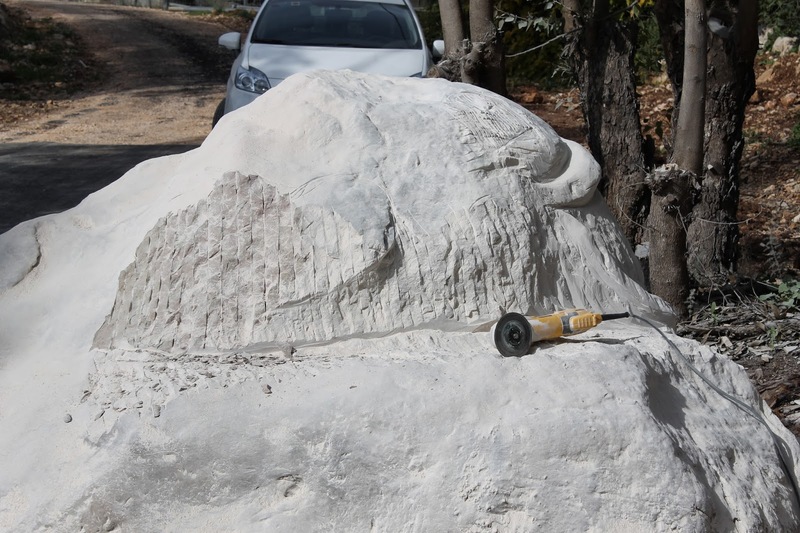 Strewn alongside the path were boulders and rocks, which were now being transformed by volunteer artist into animal shapes. There was an elephant, a whale, and more to come. We were introduced to an artist couple (both teachers) who came here to work on these stones on a volunteer basis. Peter, our Dutch artist friend, was immediately drawn to the work they were doing. The artists happily exchanged business cards. I’m always amazed by these unexpected, surprising turns of events. This often happens in Israel! It was time to say good-bye to Ishai and head for the next event. There still had been no time for coffee! In Israel, mainly cold drinks are served to guests, so we quickly drank some water before heading towards the cars. While driving the short distance to Kiryat Shmona, Wim and I managed to gulp down some instant coffee. The rehabilitative center comprised of a low building which was surrounded by a garden. The spacious courtyard was full of people, guests, children from a local high school who volunteered at the center, and the adults who worked there. 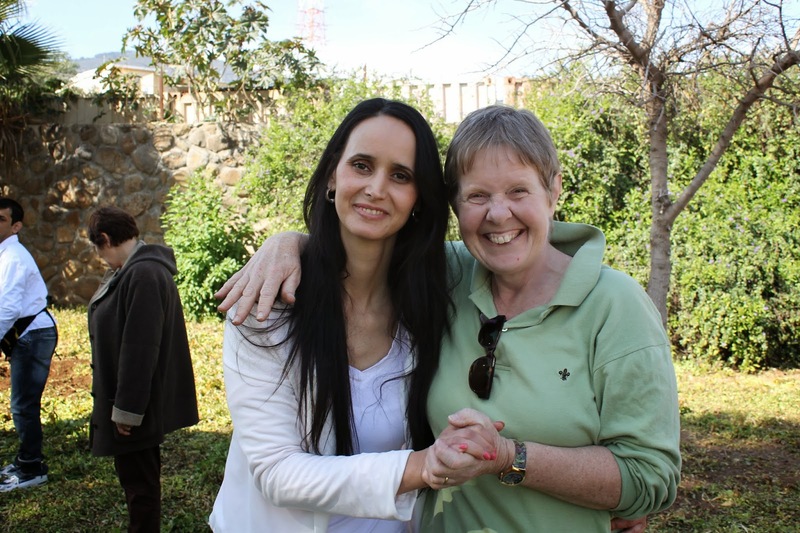 Offer introduced us to the director of the program, Sigal Kabas, so I extended by hand. “I don’t want a hand,” Sigal exclaimed. “You are such special people! I want a hug!” We were welcomed like old friends. While preparing for the project, Sigal wanted to have our background information, so Yudit suggested she take a look on our website. She had done her homework well, as we later were to find out. 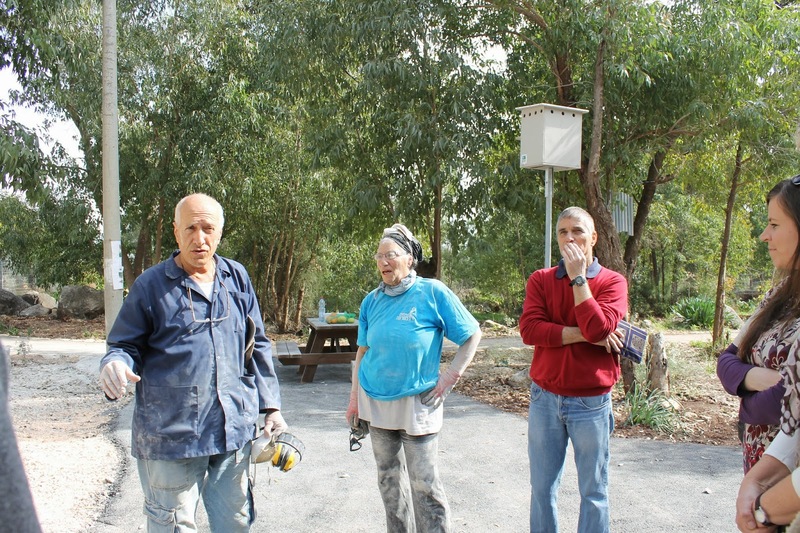 Because of the uniqueness of the event, the mayor of Kiryat Shmona had been invited. Wim and I had the honour to meet and shake hands with Rabbi Nissim Malka. 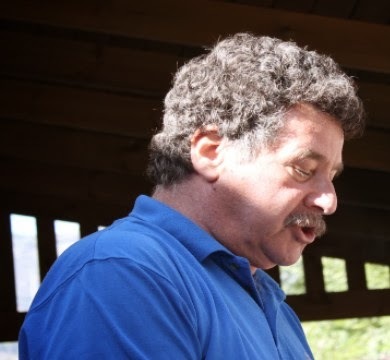 Sigal asked him how Judaism views people like us: non-Jews, Christians, taking care of four very special needs children. The mayor explained that we belong to the group of righteous people - tzadikim. Seated in honoured places at a long table laden with cakes and plates with dried fruit (in honour of Tu b’Shvat), Wim and I were again blessed with handmade presents. 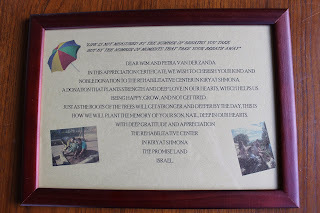 Looking at the framed certificate, my eye fell on a picture of a brightly coloured umbrella. “Na’il would have loved that,” I told Sigal. Also the quote at the end of this article, Sigal put on the certificate. It showed her love and care and painstaking research. We were touched! 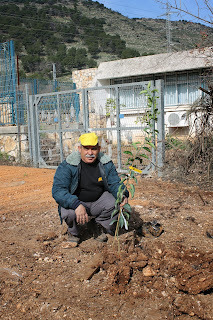 Today, we plant fruit trees in memory of a little boy, Na’il Burkan, who died prematurely. With us, his family, the couple that fostered him: Wim and Petra van der Zande. We are happy to welcome you here in the Shechafim School, which is a school for children with developmental problems, and from the different religions we have here in the North. A child is like a sapling; a sapling is like a child - in every circumstance and occasion he makes people happy, and a benefactor to his world. Both child and sapling need cultivation, love and care - and then they grow. They deserve to be beneficial/profitable, bearing fruit, giving shade and be pretty. But also a child that does not reach the summit, or does not pass his final exams, and departs from our world, sometimes leaves his own little mark in this world. Look, this little child continues to be remembered for many, many years. 30 trees were to be planted around this Rehabilitative Center. We were invited to plant a tree together with mayor rabbi Nissim Malka. The students holding the shesek tree belong to a regional high school. About four hours a week they volunteer at the Center. This mandatory part of the school curriculum is a wonderful way to teach pupils community service. 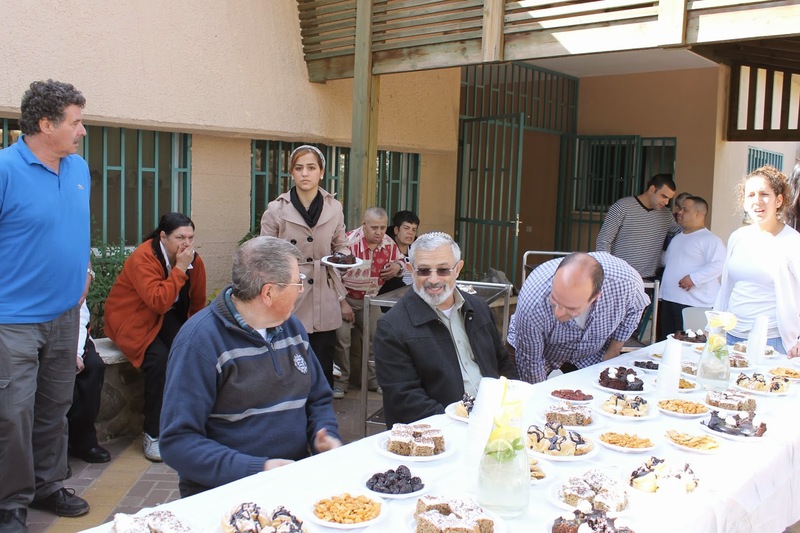 While the rest of the trees were planted, (different varieties) we were invited to enjoy the cakes and goodies that were on the table. Wim and I also felt at home at this Center - which reminded me of Nadia’s work place at Elwyn in Jerusalem. By now it was almost 1 p.m. Treated like V.I.P’s in Sigal’s office, we finally enjoyed a cup of freshly brewed coffee. Offer shared how he had come into contact with the I.C.E.J, over 20 years ago. We thanked Sigal for the wonderful celebration, and the opportunity to help them with trees for the Center. It was such a blessing to finally meet Offer in person. I had heard so many good things about this special man, and thanks to his efforts, Na’il’s tree project had become a double blessing. Only the next day, the experiences of the previous day begin to sink in. Looking at the pictures, we realized how special everything had been. In this appreciation certificate, we wish to cherish your kind and noble donation to the Rehabilitative Center in Kiryat Shmona. A donation that plants strength and deep love in our hearts, which helps being happy, grow and not get tired. Just as the roots of the trees will get stronger and deeper by the day, this is how we will plant the memory of your son, Na'il, deep in our hearts. 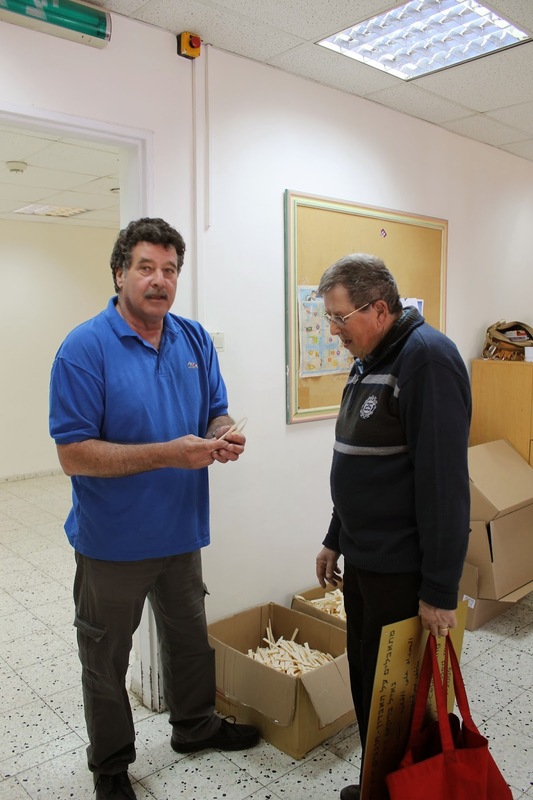 With deep gratitude and appreciation, The Rehabilitative Center in Kiryat Shmona. Both projects were linked to Na’il’s life: it had been cut short while he was still at the Ilanot School in Jerusalem. He didn’t live long enough to work at a Rehabilitive center, but Nadia does. Our 25 year-old (ex) foster daughter works in a similar Center in Jerusalem. Both places were blessed with trees, to be enjoyed by generations to come. Through our special needs children, we met many precious people - those working for the well-being of the weak in society. The children and people which are close to God’s heart. Wim and I came to Israel to bless God’s people. In return, we were blessed; and continue to be abundantly blessed, as you can read in this TALE OF TWO PROJECTS.